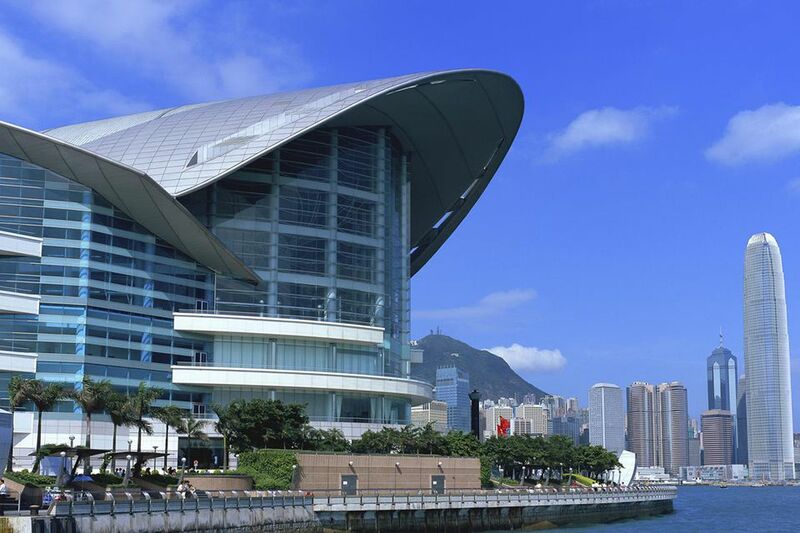 The Hong Kong Convention and Exhibition Centre (HKCEC) and AsiaWorld-Expo are the two main convention centers in Hong Kong. The Centre, located in Wan Chai North on Hong Kong Island on the scenic Victoria Harbor, opened in 1988 and was expanded in 1997. Since opening, the Center has welcomed over 112 million visitors and has held over 47,521 events. The stunning building with an aluminum-clad roof soaring like a bird into the sky contains 91,500 square meters (984,898 square feet) of event and exhibition space. Since there was limited space on the harbor for building, when the expansion was constructed, it had to be suspended above the harbor in an unusual top-down construction technique drawing commendations from the world of architecture. It's a major landmark on the harbor and is linked by covered walkways to nearby hotels and commercial buildings. The Hong Kong Convention and Exhibition Centre area transport system is excellent. The easiest way to get there is via MTR (subway). Wan Chai MTR station, on the Hong Kong Island Red Line, is about a ten-minute walk following the signs from the HKCEC along tunnels and walkways. The Star Ferry offers a direct connection to the HKCEC via the attached Wan Chai Ferry Pier, which has services to Tsim Sha Tsui and Hung Hom in Kowloon. Bus services 960, 961, 40, 40M all stop next to the HKCEC, while the free airport bus service, which connects with travelers on the Airport Express train service at Central Station, also serves the exhibition center. You can visit the Golden Bauhinia Square next to the center on the harbor promenade and see the giant golden statue of the Bauhinia flower, the official flower of Hong Kong. The Chinese make a point of visiting the square to take photos of the Reunification Monument and see the flag-raising ceremony at 8:00 a.m.
You can also walk the 2-hour Wan Chai Heritage Trail which is a self-guided walk through the shopping district with stops at 15 points of interest including temples, markets, government buildings, and historic homes (you'll need to translate the web page online and print it out). The Tai Yuen Street Market is a traditional Chinese market where you'll find a narrow alleyway of stalls selling inexpensive toys and colorful goods. There is also a produce market on the next street. Both make for good photography and an enjoyable way to spend an hour or two.